This will surely blow you away, or at least blow away all of your worries through magnificent clouds produced by the superiorly designed Q-Box 50W TC Box Mod by Smok. This temperature control box mod has an adjustable temperature range of 200ºF to 600ºF and is compatible with stainless steel, Ni200 and titanium elements. Constructed from durable zinc alloy material, the Q Box is conveniently small, weighing in at only 119 grams, while still boasting a beautiful OLED display, measuring 0.96 inches. Powered by a built-in 1600mAh battery, it supports micro USB charging and can be ready to go from completely dead in less than 2 hours. It produces a power output range of 1W to 50W and an output voltage range of 0.1V to 9V, giving you all the power you can handle or choose to lower, pending on your mood of the day. The power mode resistance ranges from 0.1ohm to 3.0ohm and the TC mode resistance ranges from 0.06ohm to 3.0ohm, promoting even more adjustability through its convenient settings. The Q Box 50W TC Box Mod should already be in your cart ready to purchase but, in case not, we thought we'd mention it has a slew of other unique features including short circuit protection, atomizer recognition, overheat protection and puff monitoring. 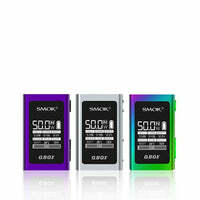 Q-Box 50W TC Box Mod - Smok has a rating of 5.0 stars based on 1 reviews.